Activity ratios are used to measure the ability of a business to convert different balance sheet accounts such as inventory, accounts receivable, and accounts payable into cash or revenue, and the managements ability to control the resources of the business. This activity ratios calculator will help you to estimate the accounts receivable days, inventory days, and accounts payable days of your business for use in the Financial Projections Template. 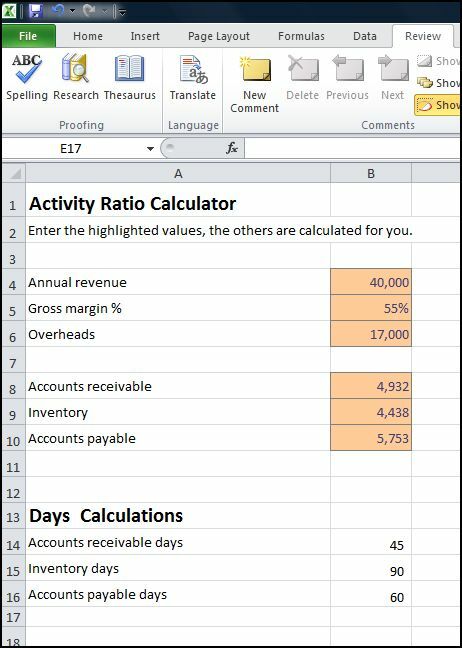 The Excel sheet, available for download below, helps a business calculate the activity ratios by entering values for revenue, gross margin, overheads, accounts receivable, inventory, and accounts payable. The activity ratios calculator is available for download in Excel format by following the link below.